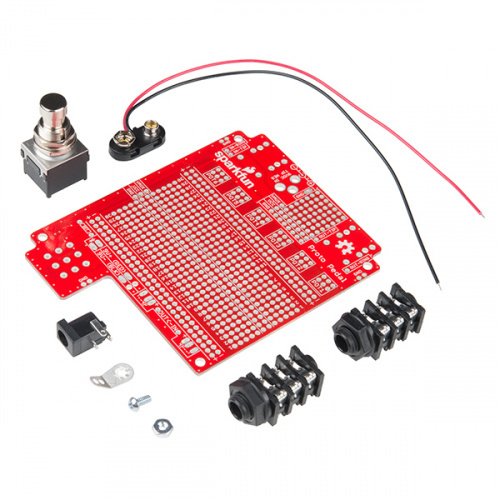 We released the SparkFun Proto Pedal - an easy-to-assemble kit that makes building guitar effect pedals easier - in September, and have been making all manner of sounds with it since (check it out our video of it in action here). The Proto Pedal kit and chassis have both hookup and theory guides, but once you've got it all assembled and looking polished, what do you do with it? Naturally, we have some ideas. Why not use the following tutorials to build a programmable digital guitar pedal or a gyrator-based analog equalizer? After you do, feel free to send us recordings of all your masterpieces. I strongly recommend that you take a few minutes and label your "finished product" with a descriptive name, and preferably each of the controls and connections with what they're for. I was "cleaning up" a few months ago, and came across an old project that I'd built likely 25 years ago, very neatly done, both inside and out, but no labels. For the life of me, I can't recall what it was for or where I'd found the inspiration/design. I could not agree more. I have gotten into the habit of documenting my projects on my personal Wiki and creating a QR code for each project link. That way when I take the project to my local hacker space (shameless plug Shop 23b) if others are interested they can scan it and have all of the docs to go with it. Well, when I built the one mentioned, cell phones were rare monsters, and had no cameras with which to scan the yet-to-be-invented QR codes, nor was their any such thing as a "Wiki" (or, for that matter, anything called a hacker space). I'd almost be willing to bet that 25 years from now, the "documentation/communications" technology will have changed so dramatically that your QR code, while a nice idea, will be useless (e.g. the entity hosting your Wiki will no longer be doing so or the URL will have changed so dramatically that the QR code will not lead to it). IMHO, some sort of "human readable" labeling and (directly) human readable documentation (such as paper in a notebook) will be longest lasting. Even just scrawled markings with a Sharpie are a lot better than nothing, though being neater and using a label maker are prettier on the project itself. If you've got printed documentation, "others [who] are interested" can take pics of it with their cell phones. BTW, I also have some others from more-or-less the same time period that had "embossed plastic" labels. The labels have long since fallen off, but you can still read the text in the adhesive residue where the labels had been! I think a combination isn't a bad idea. Keep a live version on a wiki for ease of access and sharability, but then keep a printed archive in a 3-ring binder somewhere for hard-copy referencing later. I've thought about at some point using those old smaller thumb drive or SD cards that are lying around and putting all files on them and leaving them in the project. Current media is small enough to actually stay in the project and has the advantage of anyone who has or is using the project can access it. But if you start doing this you need to remember that no matter how much you upgrade in the next 50 years you should make sure you have a USB slot and or SD card reader. This is great advice to keep in mind. I was trying to get a commercially available clock to pick up the WWVB signal to re-synchronize the time after the "fall back" this past weekend. The back of the clock had a URL printed on it for instructions. I said to myself "I bet that URL no longer exists". Sure enough, the page was gone. The product couldn't have been much more than 5 years old, if even that. Just in case, did you try the Internet Archive? They don't have everything, but I've found lots of sites later where it saved me a headache.